I gave some basic details of the children of Thomas and Mary Sullivan when I told their story. I will endeavour to tell you more about them in this and later blogs. You can see that there is very little concordance with the tradition. Ellen and John don’t even get a look in. What does this tell us? Thomas had only been in London from c.1851, but Mary’s Sullivan family had been there rather longer. While Thomas might have wanted to follow tradition, Mary wasn’t interested, she was a London-born girl. While we can find a family connection for all the names, apart from Gwendoline, there is no pattern. The full tradition rarely lasted more than one generation out of Ireland and was fading even in Ireland in the second half of the 19th century. One can’t but feel for Thomas and Mary, born on the 27th July, their first child died five days later on the 1st August of convulsions. These must have been some sort of seizure brought on by fever. Her grandfather had died in 1863 of typhoid, but cholera was also rampant in 1866 so it could have been either of them that did for little Mary. The infant mortality rate in England and Wales in the 1870s was c.15%, so one imagines that for London it would have been very much higher in the light of the growth and density of population. Mother, Mary, describes herself as Mary Ann and the informant for both birth and death was her brother, James, who was unable to sign his name. At this time her parents were living in 8 Croucher Place, Railway Street, Bromley, Poplar. Railway Street ran north to south along the east side of the London Railway line, which terminated in the Bass Pale Ale Stores warehouse just the north-east of the West India Docks. Compared to poor Mary, Catherine lived until she was 85. She was born on 17 June at 13 Avenue, Bromley. This road ran along the east side of Campbell Road which goes up to the Bow Road. Booth in his 1889 Poverty Maps describes these streets as ‘Mixed, some comfortable, some poor’. 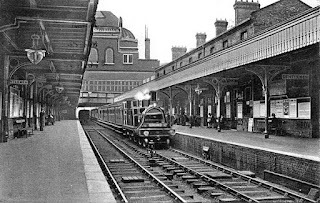 The family would have been right under the North London Railway which connected North London with the East and West India Docks; it must have been very noisy and dirty from the steam trains. 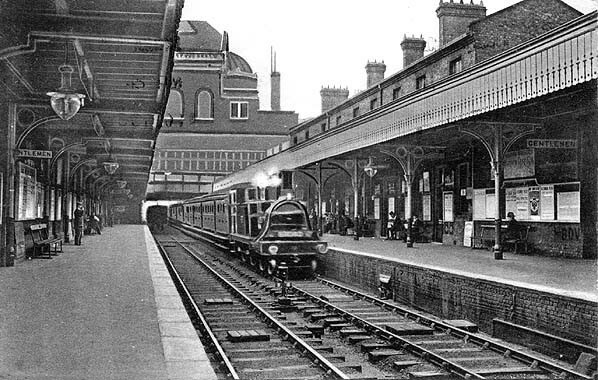 Bow Station (above) was probably Thomas’s route to work. Did he buy a ticket like this? By 1871 the family had moved down to Charles Street nearer the East India Dock Road, so one presumes that Catherine would have gone to the Wade Street School and worshipped at St Mary and St Joseph’s in Canton Street. Her mother died in 1880, Catherine was 13 and became the family’s mother figure and Thomas’s housekeeper. Education was compulsory for children under 13 in 1870 so one imagines that that was it for Catherine. I suspect she rather regretted ending her education because I have been given the impression that she was a rather shy, quiet and studious person, certainly very religious. By 1891 the youngest child at home, Mary Ann, was 14 so she could go out to work. In the 1901 census she described her occupation as ‘looks after home’. She continued to live, unmarried, with her father until his death in 1920. I was told that Catherine worked as a nanny for a shipping family named Tye who lived in the East India Dock Road. She said that they were a very nice family and that “it was not like going out into the world to work”. This was early in her working life I imagine. In the 1901 census a Patrick James and Mary Ann Tye were living at 176 East India Dock.Road. He is described as an iron ship cementer (fills in all the cracks) and as his wife is described as an employer in 1911 they must have been running a business. It’s the one on the left in this old picture. 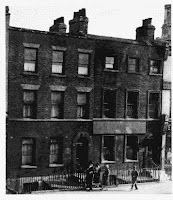 The building was on the corner of Chrisp Street and just round from where Catherine lived. They had one child, John, of 18, hardly material for a nanny! They did, however, employ a servant. By 1911 Patrick had died and Mary Ann was living with her niece, Mary Ann Deeble, who was 11, plus a servant. She was running the company. In 1911 Catherine was a washer woman working from home so she was probably employed to look after son, John, and possibly niece, Mary Ann, any time between 1891 and before 1911. She is said to have been in service in the West End and in particular the Old Brompton Road. I cannot add anything to that, but sometime after the 1914-18 war her employer was a Nora Barton Wilson, whose daughters went to a Ursuline Convent. A Ursuline school was founded in 1892 in Wimbledon. This is the original building. It is the only one in the west London area so one imagines that this was it. In 1911 there was a Barton-Wilson (very few folk with that name) family living in Kingston upon Thames (right sort of area), but the lady of the house was a Jane Mary a widow of 61, with a son of 37. I cannot find a Nora anywhere so that’s as far as I have got. She regaled the children with stories of Ireland. Bernie, Len and Kate Hosford remembered them well. Aunt Kate was an inveterate storyteller. She told the children that she had heard a banshee. She used to say "If you hear the banshee trouble will follow". One is supposed to hear such noises in the night when the last of a great family died in Ireland. She heard it the night her grandmother died (in 1889) and the name she used was O'Connor, which of course was the case. 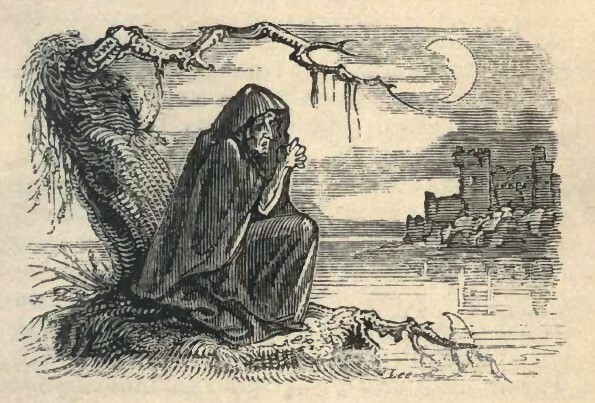 The banshee was most likely to be seen at midnight, dusk or dawn. In other words when light was poor. She might appear on strangely formed rocks or hills, by rivers and lakes or by the house where the person was dying. The most common manifestation was as a lady washing or combing her long hair. There were different banshee personalities for individual areas and they were often associated with the fairy queens. Individual families had their own character and there were two for the O’Connors and one for the O’Donoghues. She used to say that the family was from Ross Castle in Killarney. When I first got to know Bernie, that’s what he said. So Catherine was to blame for me wasting many years trying to find our lot in that area! To recall, from around 1900 our family lived in Cotton Street and the Phillips family lived next door. Catherine was a very good needlewoman, dressmaker and made the children’s clothes for both the O’Donoghue and Phillips' families. She was a quiet, gentle person who both families went to when they wanted any little job attended to or needed to talk a problem over. She was a vegetarian. She never made outside friends or went out with anyone. She went to the pictures only twice, once with Kate Phillip's mother and father and with my father, George. She was very shy. Maureen is the only one of us to have met her and remembers a very old lady who lived on the top floor of 60 Cotton Street and never went out. In 1939, she went to live with Mary Phillips in Dagenham, where her sister Mary Ann (who married Mary’s father) was already living. She was looked after variously by Mary, Lottie and Kate Phillips until she died in 1954 at Mary’s house at 41 Winifred Road, Dagenham. Mary’s husband Arthur Williams was the informant. Born on 21 November 1869 at 13 Market Street, two years later he was dead from compression of the brain. This is pressure inside the skull that pushes on the brain and cerebrospinal fluid. This is most commonly the result of a head injury that causes bleeding or swelling in the brain, but also can be due to a tumour, abscess, or increase in cerebrospinal fluid. Whatever caused it, it was another awful blow to the family. Thomas and Mary must have been distraught. She was born on 3 July 1872 at 83 Augusta Street and named after her maternal grandmother. But to make sense of her life has proved very difficult. One thing is clear, the two sisters, Catherine and Margaret, were entirely different personalities. She vanishes from the records between 1882 and 1901, but reappears in the 1911 census living with her father at 21 Cotton Street, age 38, single with no children and with an occupation of servant. There is a column on the census form that asks whether you were an Employer, Worker or Own Account. Margaret is described as Own Account and I haven’t seen that designation in the family. Might this suggest a somewhat independent lady? My main family sources have been Kate Hosford (née Phillips), Bernie and Len. With family stories memory plays tricks but this is her story as best remembered. She was a nurse at The London Hospital (today the Royal London Hospital is on the Whitechapel Road) or a London hospital. She was also in show business on the chorus line. She looked after a Jewish boy (possibly in the West End) and his parents gave her their store. She used to speak of a girl named Golda whose brother she was very fond of and who gave her a lovely gold watch. Did the brother become her husband? I have been told that she was married and possibly had two children, one of whom was killed, which broke their hearts. Her husband was a rich Jew possibly named Hyman, Ivan or Herschel. They lived in Aldgate and the family had a shop or business there. Margaret became a drinker and her husband came to see Thomas, her father, who died in 1920, and was heartbroken but could take no more. He was a thorough gentleman apparently. This history implies that the marriage must have taken place after 1911 and before 1920. She had beautiful clothes. She always wore a black veil over her face when going out. Her skin was lovely and she always used the same perfume. Sadly no one seems to have had a photo of her. She used to visit Aunt Kate on Saturdays. She was the only one Margaret would take notice of when she had been drinking. The drinking caused her to lose everything and she finished on the street. James, her brother, turned her away which he always regretted. In her later years she lived in Whitechapel, but was believed to have been in Poplar in 1941-2 and may have been killed in the bombing. I have not been able to confirm any of this sad story. After 1911 I cannot find her in the records. She has been the most elusive of our ancestors. I will continue to look.